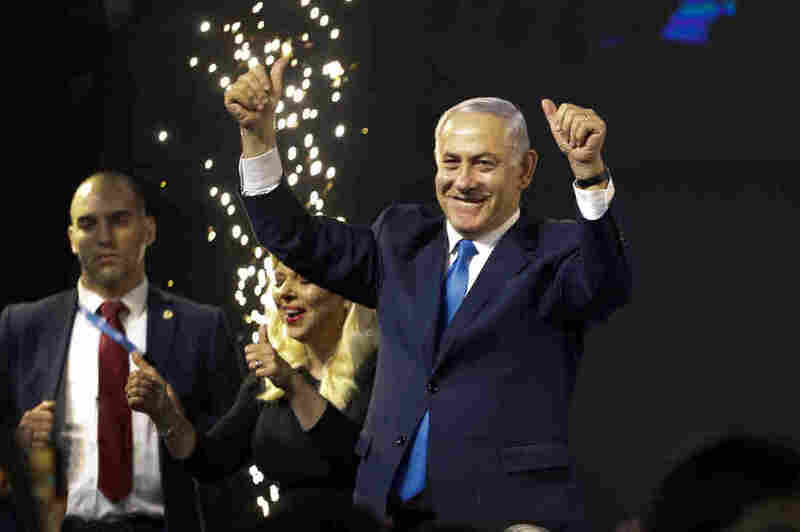 Israel Election: Netanyahu Appears Headed For Fourth Consecutive Term With almost all votes counted, Prime Minister Netanyahu has the best chance of forming a government of right-wing parties. His main challenger has conceded defeat. "We respect the decision of the people," Gantz said at a press conference on Wednesday evening. Netanyahu and Gantz, a former military chief of staff, both declared victory shortly after the polls closed. But according to Haaretz, parties in the right-wing bloc total are poised to take 65 seats, eclipsing the 55 seats from the center-left bloc that would likely align with Gantz. He and other leaders in his party have indicated that they will act as opposition to Netanyahu in parliament, rather than joining his coalition. "We didn't win in this round. We will make Likud's life hell in the opposition," said Yair Lapid, another leader of the Blue and White alliance, according to Reuters. On Wednesday, Gantz wrote this message to his supporters, according to the Associated Press: "Our voters asked for hope and we gave it to them. They wanted a different way and we outlined it." In the final days of the campaign, Netanyahu has vowed to annex Jewish settlements in the occupied West Bank — a move that would quash any remaining hopes of a two-state solution to the Israeli-Palestinian conflict. As NPR's Daniel Estrin reported, Palestinian official Saeb Erekat saw Netanyahu's victory as a sign that the occupation was far from over. "They want their occupation to be endless, and they want us to live under a continued deeper apartheid system than the one that existed in the darkest hours of South Africa's apartheid," Erekat said. One major complicating factor for Netanyahu is that he is accused of corruption and could face indictment for bribery and other charges. The allegations are related to allegedly accepting gifts from wealthy businessmen and allegedly conspiring with media moguls to trade favors in exchange for positive coverage. If indicted, "it could spell the beginning of the end for Netanyahu. Because there are questions here — will all the parties in such a Netanyahu government stand by his side?" Estrin reported. "Will Netanyahu's own party start preparing for the day after and maybe even hold a leadership contest within the party?" He added: "This could be Netanyahu's shortest term if he does indeed secure the government."